This list was pleasurably difficult to compile—Agatha Christie wrote around eighty novels over half a century, so I had to make some hard choices but I also relished the opportunity to mull over books I first started to read when I was about eleven or twelve and have been reading ever since. There are some possibly controversial omissions here—The Murder of Roger Ackroyd and Then There Were None, for instance. This is a list of Christie favorites that I’ve enjoyed going back to time and again for more than just the plots. I hope it serves as a springboard to return to her classics and discover her other stories that may be less well known but are equally compelling. 4:50 from Paddington, 1957 (Miss Marple). Who can forget the incredible premise? From the window of a moving train, Mrs. McGillicuddy sees a strangling take place through the window of another train passing by. Jane Marple, “everyone’s favorite spinster” detective, dispatches Lucy Eylesbarrow, a college graduate, to infiltrate Rutherford Hall, a stately home situated along the trains’ route, and search for the body. The Mirror Crack’d, 1962 (Miss Marple). Do-gooder Heather Badcock meets her idol, film star Marina Gregg, at a fund-raiser and dies after drinking a cocktail. The novel shows off Miss Marple’s skill at judging character—she loves to compare people she meets with townsfolk from her village of St. Mary’s Mead—and ends with a poignant solution to the murder. Murder on the Orient Express, 1934 (Poirot). The millionaire Simon Ratchett is found dead, stabbed a dozen times, in his compartment on the luxurious Orient Express. The train has been stranded in the snow so the perpetrator must be one of the passengers—and Hercule Poirot happens to be on board. The solution is one of Christie’s flashiest and most famous. Sparkling Cyanide, 1945. Christie drew inspiration for many of her plots from her work in a dispensary during World War I. This one also features poison at its heart. A year ago, Rosemary Barton died over dinner at a fancy London restaurant. Her death was ruled a suicide but her husband begins to suspect the worst and restages the dinner with all those guests present from the year before. It turns out that everyone who loved Rosemary also had reason to want to end her life. Sleeping Murder, 1976 (Miss Marple). According to many, Christie saved the best for last. Along with Curtain, Poirot’s final case, this novel was published posthumously. A young woman buys a beautiful home where she happens to have lived as a child. It awakens her memories of having seen a blonde woman murdered there. Miss Marple investigates…creepy and unforgettable. A Pocket Full of Rye, 1953 (Miss Marple). The murders at Yewtree Lodge seem linked to “Sing a Song of Sixpence,” a nursery rhyme. Shrewd Miss Marple sees the pattern, and the cruelty and meanness behind the killings worry her and linger on in the reader’s mind. Third Girl, 1966 (Poirot). A young woman barges into Poirot’s apartment saying she thinks she might have committed a murder, and then dismisses Poirot because he’s “too old” and therefore wouldn’t understand. 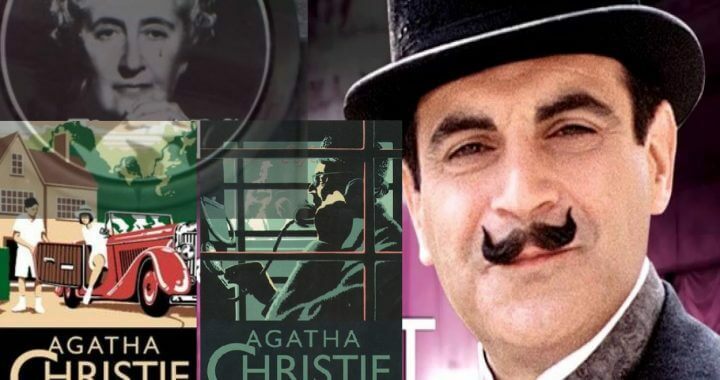 Christie got some flak for muddling through Swinging Sixties life here, but Poirot’s out-of-touchness makes for amusing reading and allows him to solve the crime. Third Girl also features the recurring character Ariadne Oliver, Christie’s comical authorial surrogate. Funerals Are Fatal, 1953 (Poirot). Wealthy Richard Abernethie dies in his sleep but his flighty sister Cora declares it was murder. A day later, she’s found bludgeoned to death in her country cottage. The family’s trusted solicitor calls Hercule Poirot to investigate. Ordeal by Innocence, 1958. One of Christie’s favorites. Darker than most, especially since it doesn’t feature any of her series’ detectives to provide reassurance. Dr. Calgary returns to Sunny Point with an alibi for Jacko Argyle, who died in prison accused of having murdered his adoptive mother. Now the case will have to be reopened—and the surviving members of Mrs. Argyle’s family begin to suspect one another. Radha Vatsal is the author of A Front Page Affair (May 2016), the debut novel in the Kitty Weeks Mystery series. She grew up in Mumbai, India, and came to the United States to attend boarding school when she was sixteen. Her fascination with the 1910s began when she studied women filmmakers and action-film heroines of silent cinema at Duke University, where she earned her Ph.D. from the English department. Vatsal lives with her husband and two daughters in New York City. For more info visit http://www.radhavatsal.com/ Her blog post on the top ten Agatha Christie novels is her first post for the Strand Magazine’s blog. Posted in Blog Article, Detectives.